For a simple contour powder and blusher, some of my favourite sets are the Rimmel Kate Sculpting Palette (£6.99), Makeup Revolution Sculpt & Contour Kit (£3.50) and Sleek FaceForm palette (£9.99). These are all great value kits that have a bronzer, blusher and highlighting powder. For a more detailed contour you can purchase palettes with various different bronzing shades as well as some lighter shades for highlighting. 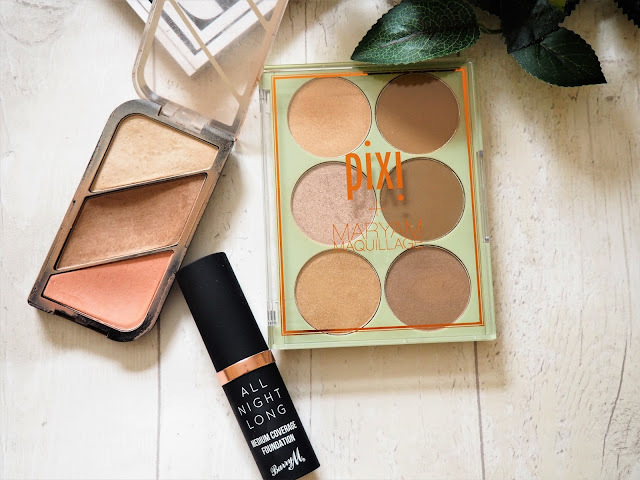 I love Makeup Revolution HD Pro Powder Contour Kit (£8.00), Nip & Fab Contour Palette (£15.00) and Pixi + MARYAM MAQUILLAGE Strobe & Sculpt Highlight & Contour Palette (£24.00). 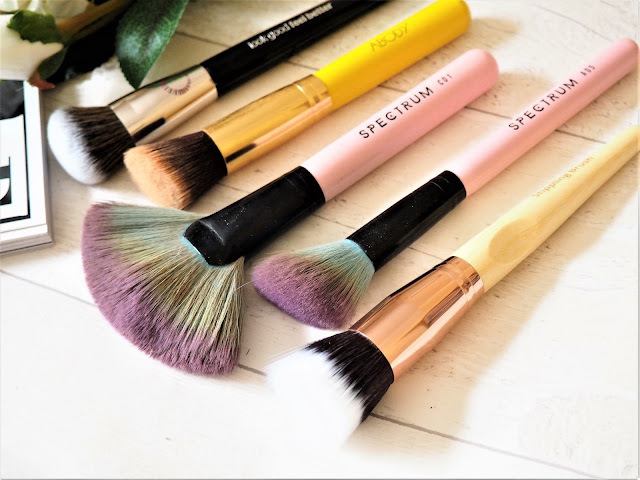 When I'm contouring I start by applying an even layer of foundation using the So Eco Stippling Brush (£8.99, very.co.uk) and then blending it out with a BeautyBlender sponge. 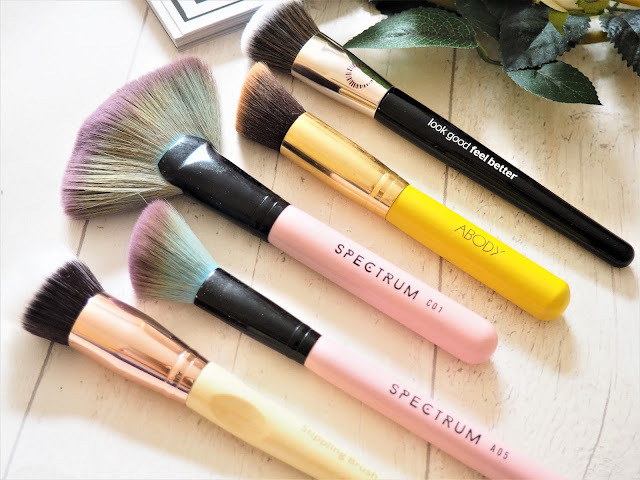 By far my favourite makeup brush for contouring is the Spectrum Collections No.1 Fan large fan brush (C01). This costs £9.99 and is a large and thick fan brush that can be used for applying either highlighter or bronzer. I prefer to use it for my bronzer to sculpt my cheekbones. Once my contour powder is on I put some highlighter above this towards the top of my cheekbones using Spectrum Blush Crush (A05, £6.99) as this is slightly slanted. 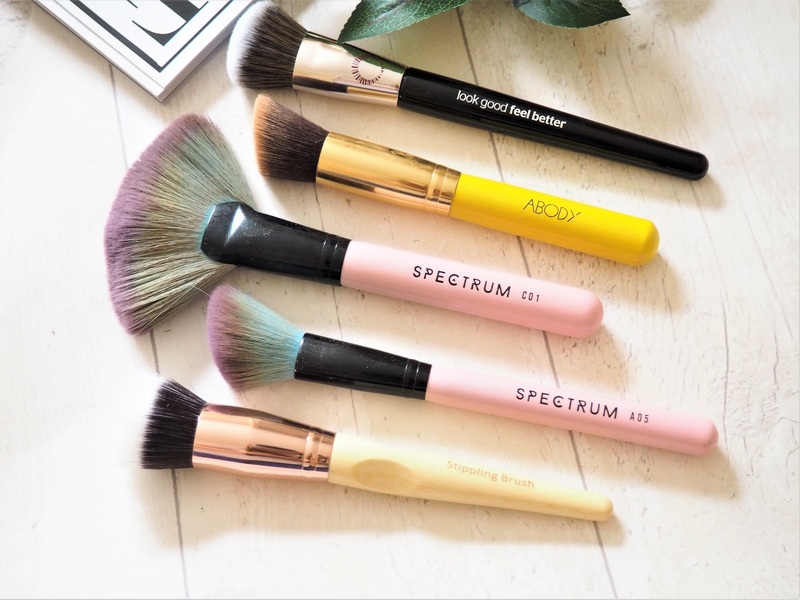 I also have a set of ABODY makeup brushes from Amazon which were a bargain (£5.99 for 9 brushes, here) and I use the slanted brush to apply highlighter. Then I pop blusher on the apples of my cheeks. Again I use a SoEco brush for this or the Real Techniques blush brush. Finally I set it with powder. I love Rimmel InstaMatte Powder and Cover FX translucent. 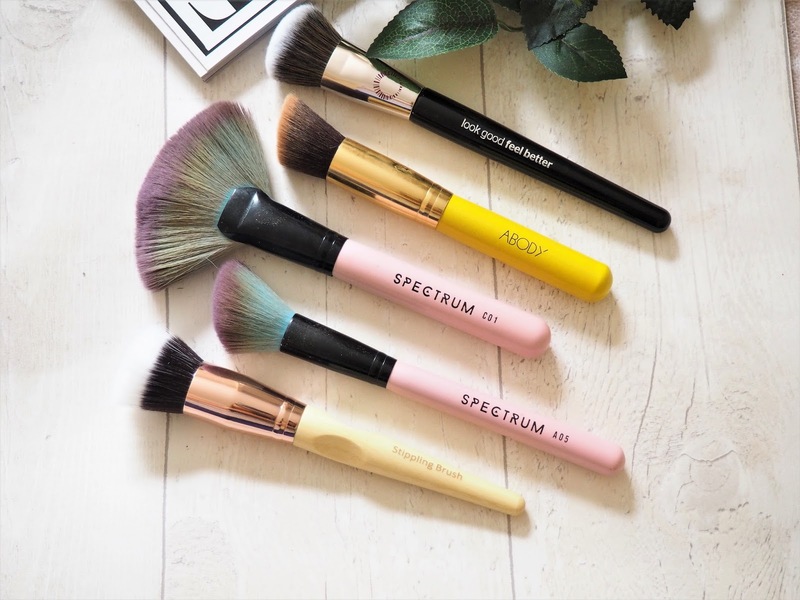 I apply my powder with a large fluffy brush like the Look Good Feel Better Multi- Tasking Brush, (£11.99 , lookfantastic.com).